I'm back again with another Christmas Card. I promise I'm almost done with them. So far I've made approximately 60 of them and believe me, I think I've had enough. I'm so far behind on my birthday cards and other cards that I need to do. I decided to use another one of the cards from Kristina Werner's Holiday Card Series for inspiration. I really liked this card; but I did not have any ornaments to cut out to use, so I adjusted that part of it. I recently got a new set of Nestabilities: Label One and thought they would be perfect. 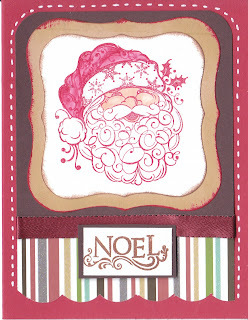 Once again I also used paper from my American Crafts "Merrymint" collection. I know I've used it a lot lately; but it's what I have, so why not, right? The Santa Clause image is from Inkadinkado. I stamped it with Ruby Red ink and then used Copic Markers to color his face and then my blender pens and ink pad for his hat. I wanted to add a bit of shadowing in his beard, so I used a Cool Grey Copic to go over various parts of it, which is hard to see in the picture; but does add some interest in real life. The sentiment is from the same Inkadinkado set and I stamped it with Chestnut Roan chalk ink. The ribbon is from Lil Davis Designs. I have to say I was rather pleased with the way this one turned out; and I hope you like it as well. This is so pretty, I love the colors and that Santa image is too cute! What a jolly Santa! I love your white faux stitching! Oh how cute, I love the santa!